Slowing subscription growth, rising competition, and cyber-security threats could all take a toll on performance. 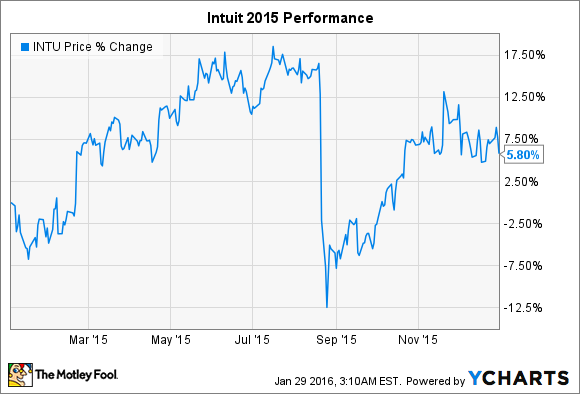 It was a volatile year for software giant Intuit's (NASDAQ:INTU) investors. Shares rallied to start the year but then plunged in August, following the release of a surprisingly disappointing quarterly report. Intuit stock bounced back slightly in the later part of the year, ultimately closing up nearly 6%. Yet Intuit stock could be headed lower. Following are three reasons Intuit could fall. Although a general market rally could always lift shares even if all three scenarios come to pass, they aren't likely to excite Intuit shareholders. Intuit is in the midst of a transformation -- from a company dependent on the sale of traditional, desktop-based software, to one whose business depends on cloud services and the sale of online subscriptions. In August, Intuit announced that it will sell off Quicken, Demandforce, and QuickBase to focus on QuickBooks and TurboTax -- two products more readily adaptable to the cloud. QuickBooks Online is the cloud-based, subscription-based alternative to Intuit's traditional small business application. Intuit's management has placed increasing emphasis on the gradual transition of this business, drawing particular attention to the growth of QuickBooks Online. The growth has been indisputably strong -- QuickBooks Online subscribers rose 57% last quarter, bringing the total subscriber base to nearly 1.2 million. Meanwhile, sales of its traditional QuickBooks desktop offering were flat. The move to subscriptions benefits Intuit, by assuring more regular, and more consistent, revenue. It also benefits customers in an increasingly mobile world. Overall, it's not particularly novel -- many other software companies, including both Microsoft and Adobe, are currently attempting something similar. But any transformation carries risks, and if it Intuit's cloud growth slows, it could be met with selling pressure. Last year, shares of Adobe slid after the company reported lower Creative Cloud subscriptions than analysts had expected. Intuit's other major business segment, TurboTax, faces a variety of competition, most notably from tax specialist H&R Block (NYSE:HRB), which focuses primarily on assisted returns -- that is, tax returns done in person at one of H&R Block's many retail locations. TurboTax, in contrast, focuses on do-it-yourself tax returns -- those filed by individuals on their own behalf, using only the aide of TurboTax's software. Intuit dominates that segment, historically processing about three times as many returns as its competitors. During a presentation in December, Intuit's Sasan Goodarzi explained that the company hoped to grow its TurboTax business by expanding the base of do-it-yourselfers over time. But even within that segment, Intuit faces competition. H&R Block offers H&R Block Deluxe, software that largely mimics TurboTax. At an analyst day in December, H&R Block's Jason Houseworth explained how the company would take share from TurboTax, working to exploit changes in Intuit's pricing. Last year, Intuit opted to make federal and state filing free for all basic tax returns. However, it raised its pricing on more complex returns. H&R Block left its pricing unchanged and gained share among these higher-value clients. H&R Block has also been working to improve the features of its software, and in a recent comparison, Consumer Reports declared that H&R Block Deluxe was "better for do-it-yourself newbies." Intuit remains dominant in the space, but rising competition could weigh on its TurboTax business over time. Lastly, cyber-security remains a major risk factor. Last year, Intuit's TurboTax had to temporarily halt federal e-filings after an apparent wave of fraudulent returns. Given the nature of Intuit's business -- it deals with particularly valuable financial data -- it may stand out as a primary target for cyber-criminals. Management has consistently assured investors that security remains a top priority for the company. Intuit has taken other steps, such as giving TurboTax users the ability to enable two-factor authentication on their accounts, to alleviate risk. But attacks could discourage customers, undermining their confidence. Last April, two former TurboTax customers sued Intuit after their identities were stolen. Given the nature of cyber-crime, it's nearly impossible to quantify, but a major security breach could weigh on the stock.